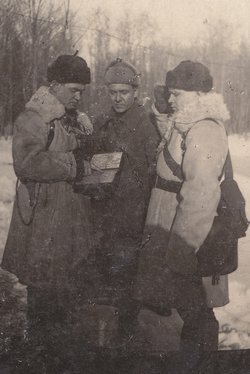 A. Gruzdev is in the center, 1942. 1942, 4 March. [from A. I. Gruzdev to S. I. Gruzdeva in Totma] № 55. The day before yesterday I received a letter from Ivan Gasparovich. My desire is to believe that he will recover and will go on living. What happiness it would be! The food situation in Leningrad is improving, and this gives hope. They are now giving 500 gr. [17.6 oz] of bread per person. I am as before alive and in good health, but as a result of much work my nerves have become somewhat shuttered, and on my heart, like it was in Leningrad, a stone has lain. 1942, 16 March. [from A. I. Gruzdev to S. I. Gruzdeva in Totma] № 58. From 10.Mar. until today, i.e. 17.Mar., I have been sick. I fell ill on 10.Mar., on 12.Mar. I was sent to fulfill a serious operational task. For three days I worked with a temp[erature] between 39–40 [102-103ºF], slept in the open air in frost, did not eat for 5 days, but now I am resting and storing up fresh energy. In the letter I am enclosing a watercolor for my dear Natashenka. Tell her that I strongly kiss her little blond head. 1942, 19 March. [from A. I. Gruzdev to S. I. Gruzdeva in Totma] № 59. Yesterday I was a little wounded. But the injury is the most trifling. In 2 or 3 days I’ll join the ranks again. 1942, 21 March. [from A. I. Gruzdev to S. I. Gruzdeva in Totma] № 60. Up to now, I am still undergoing medical treatment. These three days are my first rest in 8 months of the War. These days, I have read a volume of Chekhov, Pushkin’s “Poltava” and, of course, I am re-reading his lyric poetry again and again. What is pleasant in the medical battalion is that in it there is electric light: it is good to write, to read, to think in leisure time. All the time I have wanted to show you, Sonya, our everyday life. Usually we, from the point of view of work, don’t make a difference between day and night. Work, it is understandable, goes on round the clock. For housing we use pits dug in the earth, covered on top with a layer of thick logs, so-called blindages. Sometimes, however, when there is no time to dig blindages, we live in small (6-8 man) tents. My job is walking to the front line and fulfillment of different tasks. About the pictures of the front line it is impossible to speak briefly. This is very complex phenomenon. Bullets, mines, shells—this is a usual phenomenon there, since there is no war without these means. We wash in most cases with snow, we drink melted snow, huts and entrenchments are also made from the snow. Food is supplied in most cases in a rolling kitchen, sometimes we cook it from concentrates. Do you remember my joke regarding porridge which I promised to eat in the army. So here, I am now fed predominantly with porridge. In winter we slept around bonfires. In minus 42° [minus 44ºF] this is no picnic. 1942, 24 March. [from A. I. Gruzdev to S. I. Gruzdeva in Totma] № 61. My darling friend, here I’ve fully recovered. Tomorrow again I go to the front line. 1942, 26 March. [from S. I. Gruzdeva to A. I. Gruzdev at the front] № 14. Anxiety for you and for Dad—I do not know whether he is living—has somehow depressed me lately. And outside there is such dazzling-sky-blue spring. […] I often look toward you—to the West. You, Dad, Leningrad… The heart has so pined for everything and everybody. But you do not worry about me and do not be upset—to this depression could be added many other anguishes—I do understand this, and I will manage.